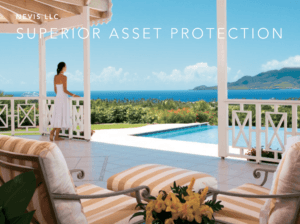 Many asset protection experts agree that one of strongest asset protection trusts is the international trust in the Caribbean Island of Nevis. 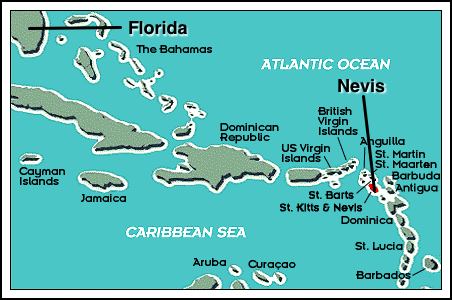 Nevis is located Southeast of Florida. It has extremely strong asset protection case law history. It is not just a theory but each time we have seen it tested it has protected our client’s assets. I’ve been in the asset protection business since 1991. Our company was formed in 1906. I teach seminars to other firms such as their attorneys and CPAs as well as businesspeople, I believe we have over 65,000 clients in our database and we have established literally thousands of trusts and companies over the years. Yes, there are domestic trusts. But if you study the case law and the increasing theories of legal liability… you will see that many results-oriented judges. 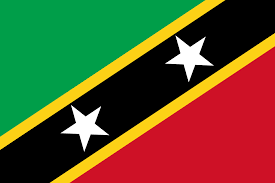 The reason the international trust works where the domestic ones done is that the local court says, “Give me the money.” The trustee, which is our Nevis Island Law Firm outside of the local court’s jurisdiction will not comply…as your local courts do not have jurisdiction in Nevis. 1. A creditor must post a $100,000 USD bond with the Nevis government before bringing legal action against an international trust. 2. 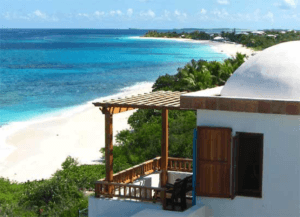 Unlike most countries, a Nevis trust can last indefinitely. 4. The Ordinance allows you to combine two trusts into one or split one trust into two. 5. If a creditor brings a fraudulent transfer action they must do so within a year of the cause of action – or the reason why the lawsuit was filed in the first place…such as a car wreck. Nevis courts won’t even hear the case. So, it’s in your benefit to set up the trust as quickly as possible and get the clock ticking. 6. In the very unlikely event a creditor files quickly, they will have to post a $100,000 USD bond and prove their case beyond a reasonable doubt and with clear and convincing evidence that the Settlor established the trust to keep money from that particular creditor. This means that if the Settlor set up the trust for any other reason, such as international diversification, estate planning, etc., it would be very difficult for a creditor to prevail. Moreover, the creditor risks forfeiting the $100,000 USD bond. Now, trust law uses the “step into the debtors shoes” theory. Whatever the debtor could do directly, the creditor can step into his or her shoes and do that same thing. So, that is why it is important that an experienced professional drafts the Nevis trust and that you have a licensed trustee such as our Nevis Law firm. Now, when we set up a trust, we want to give our clients the remote control. So, the trust owns 100% of a Nevis LLC and we make you the manager. Now, the client is the manager of the LLC which controls the LLC assets and is the initial signatory on all accounts. 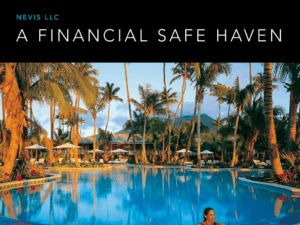 Your account need not be in the Nevis but can be in any financial institution in the world that offers a financial safe haven. Now, when the “bad thing” happens, you can temporarily have our law firm trustee step in as manager of the LLC. Now, the trustee is our licensed and bonded law firm. Plus, they went through intensive background checks to get a trustee license. By bonded we mean that the funds are insured. So, for client safety and peace of mind, the only time our law firm steps in is when the courts would take the money. When the “bad thing” goes away the string of control – the management of the LLC inside of the trust – goes back to you and you are back in the driver’s seat with all of your money in-tact. In the meantime, during legal duress, if you have bills, the trustee can pay them for you. You can have the trustee pay a trusted friend or relative who provides money for you, etc. So you still have access to your money…but your enemy-at-law does not. The bottom line is that everything you’ve worked so hard for is safe and secure. The best asset protection the trust provides is for liquid assets held offshore. The US courts has jurisdiction over US bank accounts and real estate. So, for real estate, we do what is called equity stripping. We record mortgages against the property payable to the LLC. Then, if needed, we have a third party purchase those mortgages and place the proceeds into an inaccessible account in your offshore trust. We set up a lot of these trusts for attorneys. Then the attorneys charge between $30,000 to $50,000. Contact us directly and we can set up the trust for a fraction of that amount. Please call us at one of the numbers above or fill out our free consultation form on this page.